#SmearForSmear 2019 took place from 21 - 27 January 2019. Smear tests aren’t easy for everybody, but there are ways to make them better. Read our tips on how to make your test more comfortable and help you feel more in control. Smear tests prevent 75% of cervical cancers, so while they may not be pleasant, they are important. 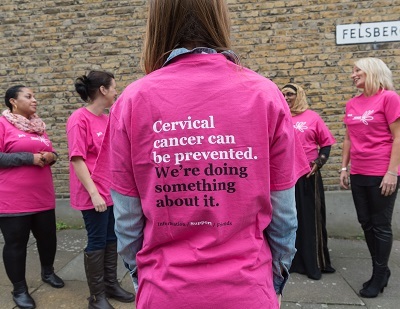 Join the campaign to ensure every woman understands the importance of screening in preventing cervical cancer. Remember our helpline is here for any questions or concerns– we’re here to support you. There are lots of reasons smear tests can be difficult. But however you feel and whatever your question or concern, you’re not alone. Read our blog series Let’s Talk About It to find out tips which could make attending that bit easier. "I have severe agoraphobia and anxiety...because of this page I've booked my smear"
"great reminder for people to get one regardless of sexuality"
"I'm a practice nurse and we have done looooads of smears this week"
With your help we can ensure every woman knows how they can reduce their risk of cervical cancer.